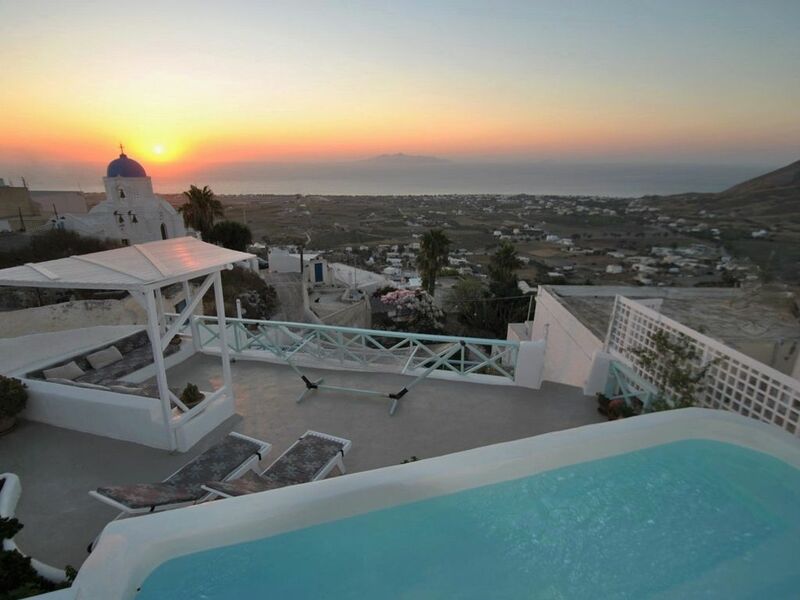 Located in the peaceful residential village of Exo Gonia, Cavern House Anthea is ideally located for exploring Santorini with the beaches of Kamari and the island’s capital Fira both within just 15 minutes’ drive. The award-winning taverna Metaximas is just a minutes walk from the door and the neighbouring village of Pyrgos offers an assortment of shops and amenities. Carved from volcanic rock, this traditional Santorinian home comprises 3 double bedrooms, 2 bathrooms (including 1 with a large feature stone bathtub) and a large open plan living area which incorporates both a dining space and a lounge. Anthea’s outside space includes a courtyard with dining area and a large sun terrace, which features a spa pool and hammock. Cavern House Anthea offers panoramic views to the vine terraces of Profitis Ilias and across the Aegean to the island of Anafi, whilst the courtyard and barbecue area provides shaded space for dining and entertaining. 24 hour airport transfers and wifi are included. Self catering villa; pool; sea view; quiet traditional cave house in the village of Exo Gonia.